In 1976, when Ronald Reagan lost his second bid for the GOP presidential nomination (the first was in 1968), most observers believed his political career was over. Yet one year later, at the annual Conservative Political Action Conference, Reagan sounded like a new man. He introduced conservatives to a "New Republican Party"—one that looked beyond the traditional country club and corporate boardroom base to embrace "the man and woman in the factories . . . the farmer . . . the cop on the beat. Our party," Reagan said, "must be the party of the individual. It must not sell out the individual to cater to the group." But it was not only the former governor's political philosophy that was changing. A new man was emerging as well: The angry anticommunist was evolving into a more reflective, thoughtful, hopeful, and more spiritual leader. Championing the individual at home, rejecting containment and détente abroad, and advocating for the defeat of Soviet communism, his appeal crossed party lines. 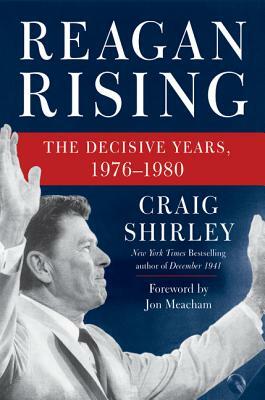 Craig Shirley is the author of Reagan Rising, Rendezvous with Destiny, Reagan’s Revolution, Last Act, and the New York Times bestseller December 1941. The founder, chairman, and CEO of Shirley & Banister Public Affairs, he is the Visiting Reagan Scholar at Eureka College, lectures often at the Reagan Library and the Reagan Ranch, and is a media commentator and contributor to leading publications. He and his wife, Zorine, live in Virginia. — Jeff Lord, Former Reagan White House Political Aide, CNN commentator, Columnist, The American Spectator. — Mari Maseng Will, former Reagan White House speechwriter.